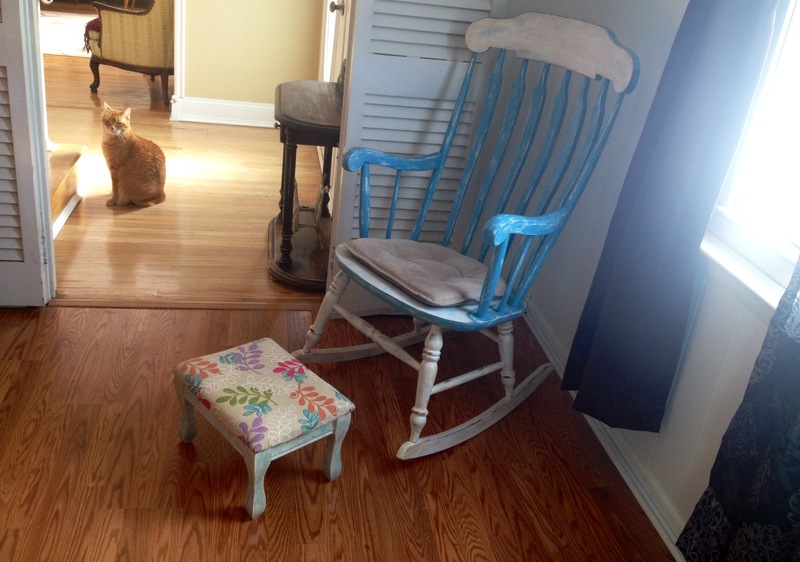 DIY design, darling decor, radiant renovations, and wonders of whimsy: On a shoestring! Brace yourselves and buckle up, because this is going to be a long one! SO much time and effort went into this nursery for my daughter, not to mention blood, sweat, and tears (I literally thought my back was going to snap in half at one point). 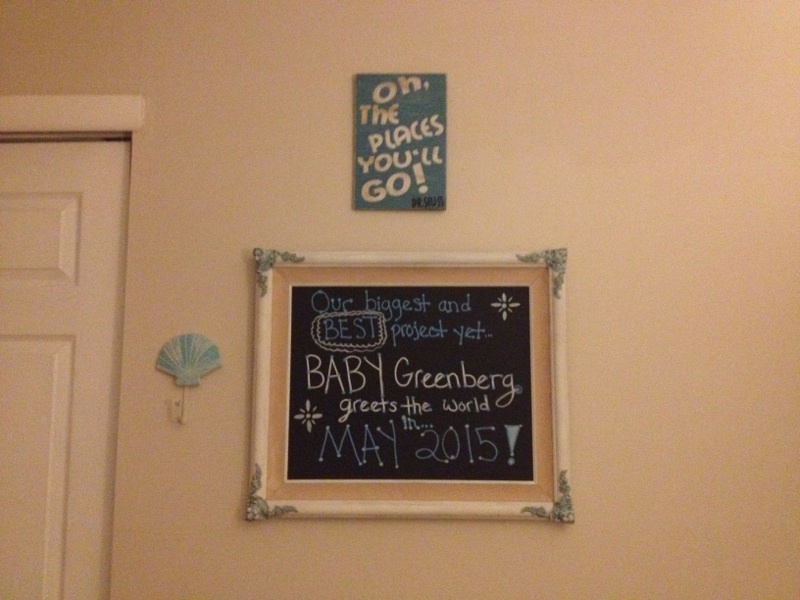 We found out the night before the first day of school back in early September that we were expecting. At this time, our daughter was nothing more than a faint pink line on a test! To start at the beginning, I have to go back to July. As soon as we decided to let “whatever happens happen”, the notorious planner and prepper in me got to work right away! Children had never really been in my life’s plan, so I never allowed myself to imagine things like what our nursery would look like. 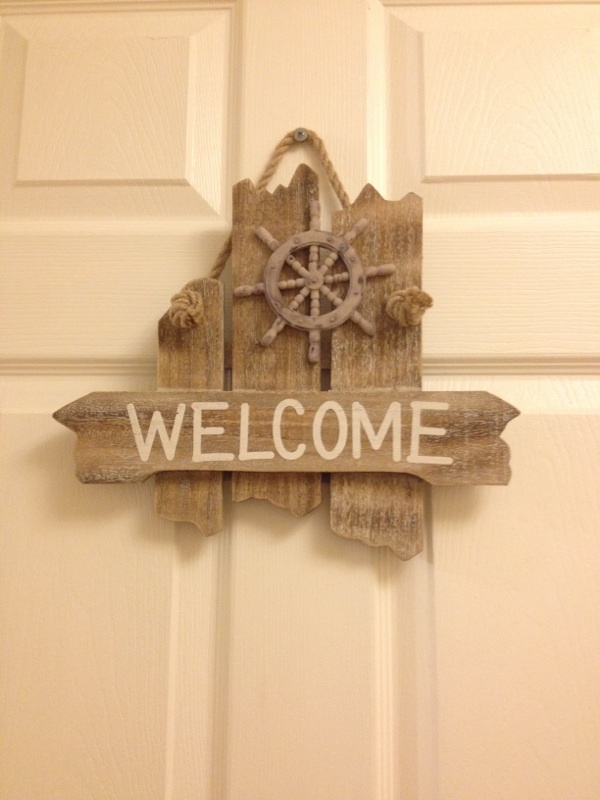 I started looking online for ideas and found details I liked, but nothing that was right. I scoured thrift stores and Craigslist and my taste began to take shape. When I found what I loved, I pounced without thinking, knowing in my usual style that it would come together in the end. 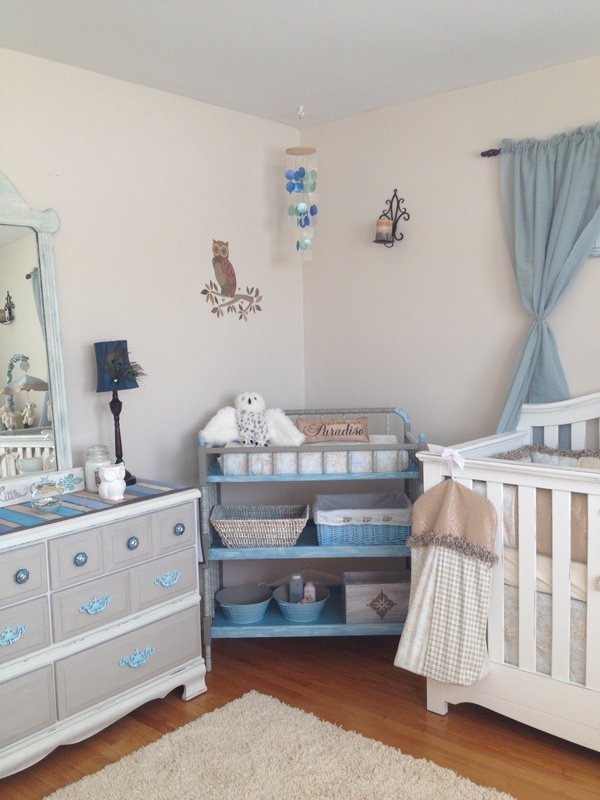 Boy or girl, I knew I wanted to work with a lot of what I had in the guest room, that I wanted my favorite neutrals (khaki/beige, warm white, shabby blue) to be the color scheme. As for a theme, I wanted a shabby cottage type of look with a subtle beachy vibe (that part got stronger as time went on). 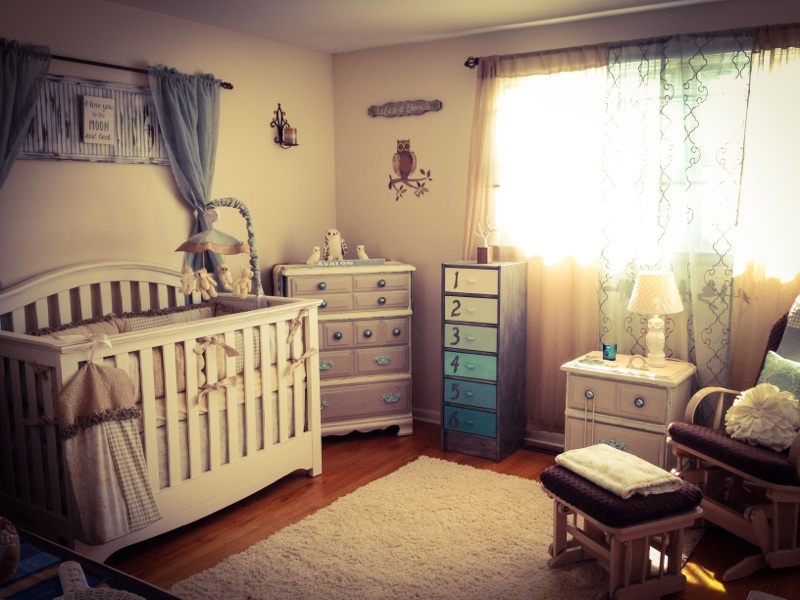 There are adorable nurseries full of ruffles, pink, blue, cars, and monsters…but none of those specific themes felt right. We knew we would opt to learn our baby’s gender, but we knew that neutral for me would never come in the form of yellows and greens (which frankly, I can’t stand). See? 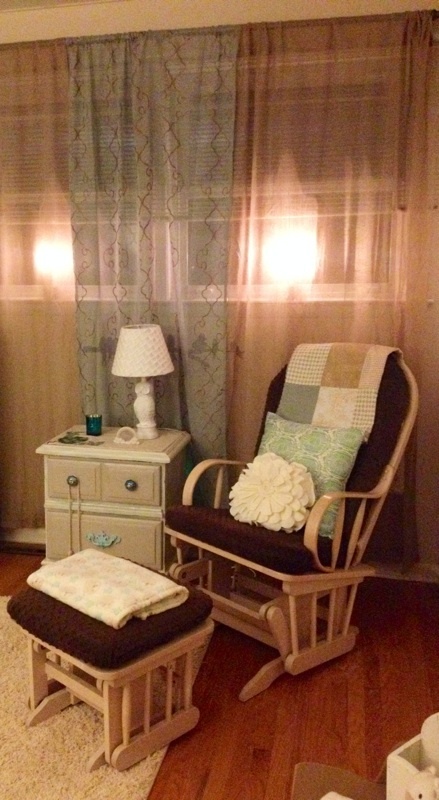 Serene, calm, cottage-esque, neutral, vintage-inspired. I came to terms with the fact that I would never be able to afford that. 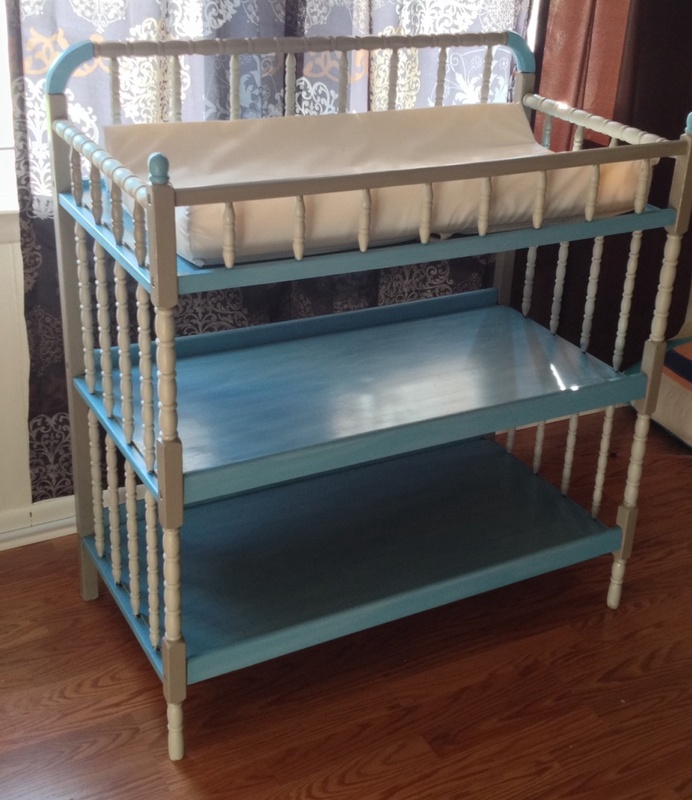 About a week later, I nearly fainted when I saw a listing pop up on Craigslist for none other than the baby bedding of my dreams, in mint condition…for $40. Yes, you read that correctly. We were in the car and picking it up that same morning. It was all the bedding, a mobile, a diaper stacker, changing pad cover, etc. Score! 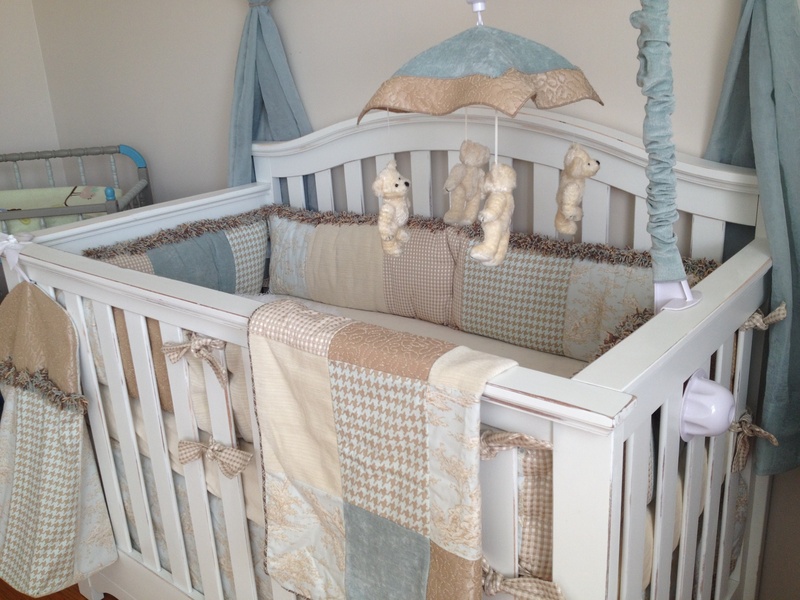 Next up was finding a crib! I knew I wanted white (no dark wood for me) and that I preferred a more modern style or a vintage-inspired Jenny Lind style. 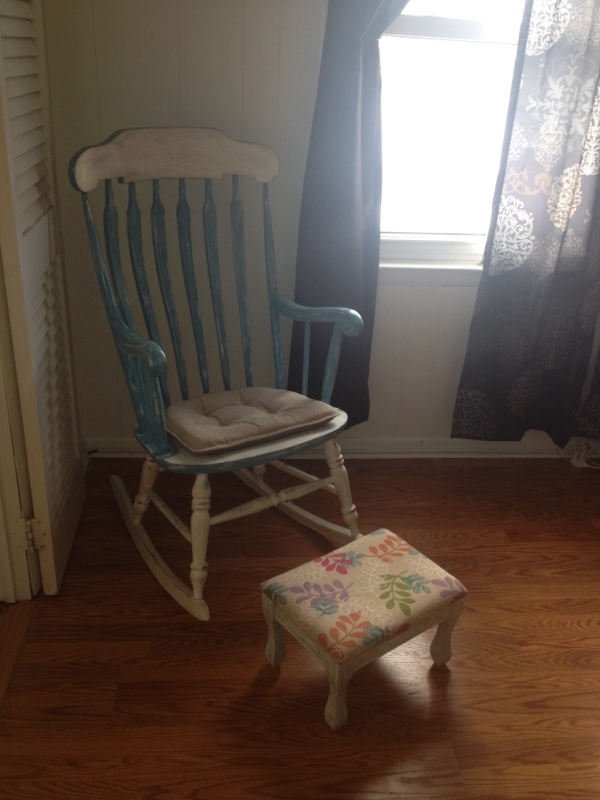 I found one I adored on a yard sale site, but it lacked the shabby feel I wanted. The fix? Jeff and I had a great time taking it out back in pieces and taking the power sander to it to distress it. An added bonus is that we now have a great memory to go with it. It was a BRU brand crib by Baby Cache. Ones extremely similar to it on the site now sell for between $350-$500. 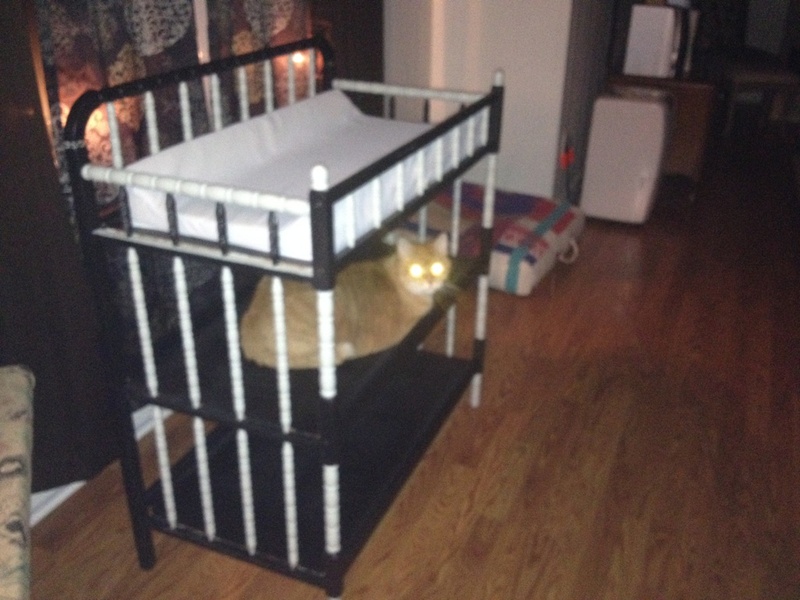 We paid just $80 for a crib 2 years old! 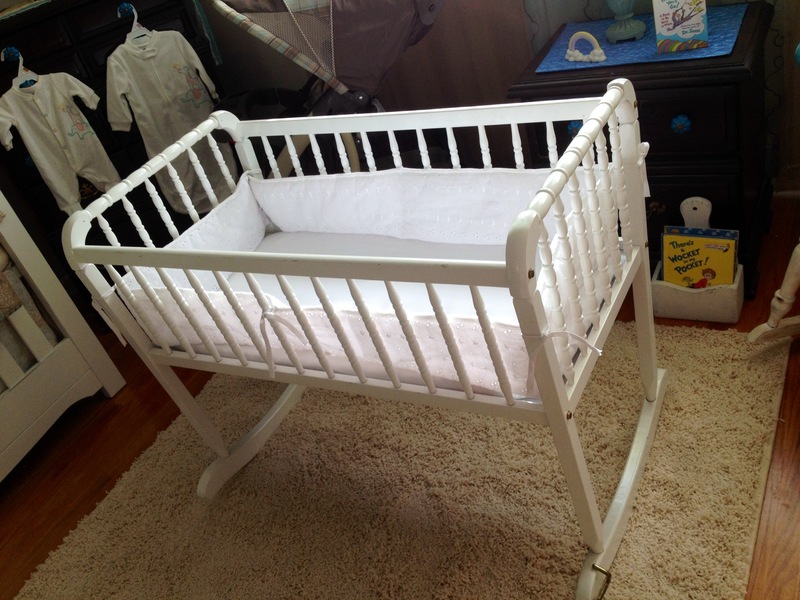 We snagged a Colgate brand baby mattress in great shape for $10 to go with the crib. Some say don’t buy used, I say find one in excellent shape and go for it. Every last accessory for it came from a thrift store, and one was gifted from a friend. The changing pad was also free! 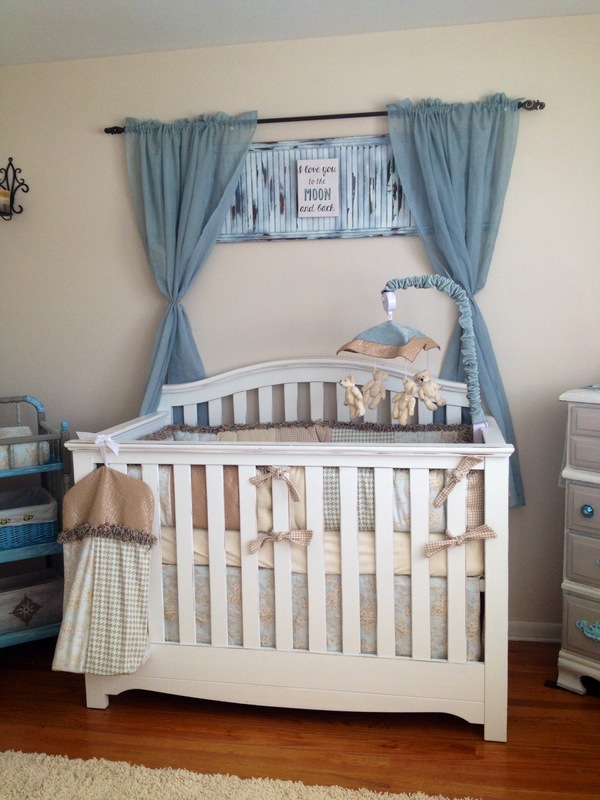 Again, I adore this vintage style, and it is extremely similar to a crib in design and feel, hopefully easing the transition later on! 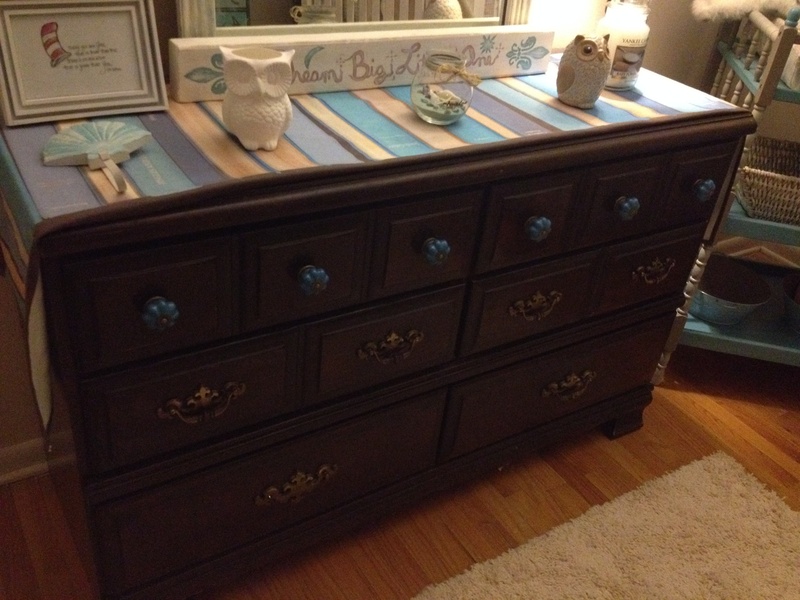 That ombre blue, numbered chest in the photo with zinc paint-job on the sides was a fun thrift-store makeover blogged in a previous entry. 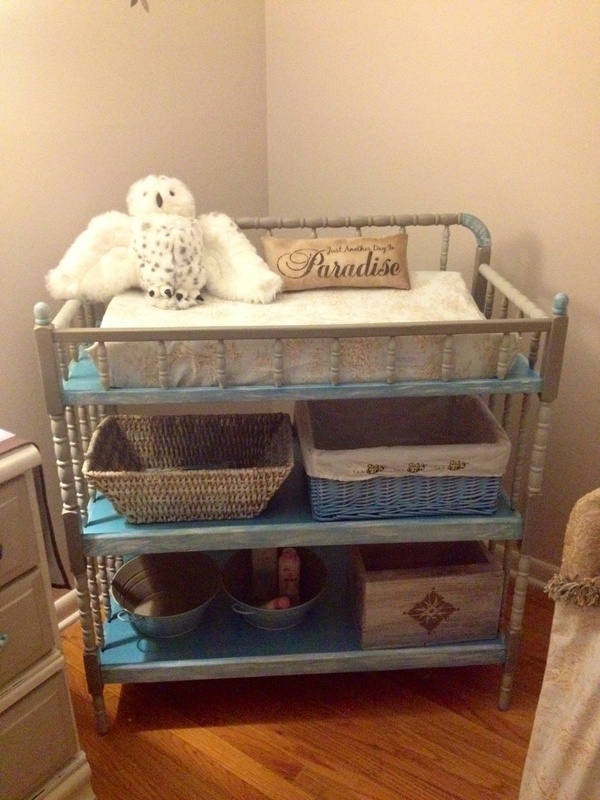 It fits in the nursery so well! 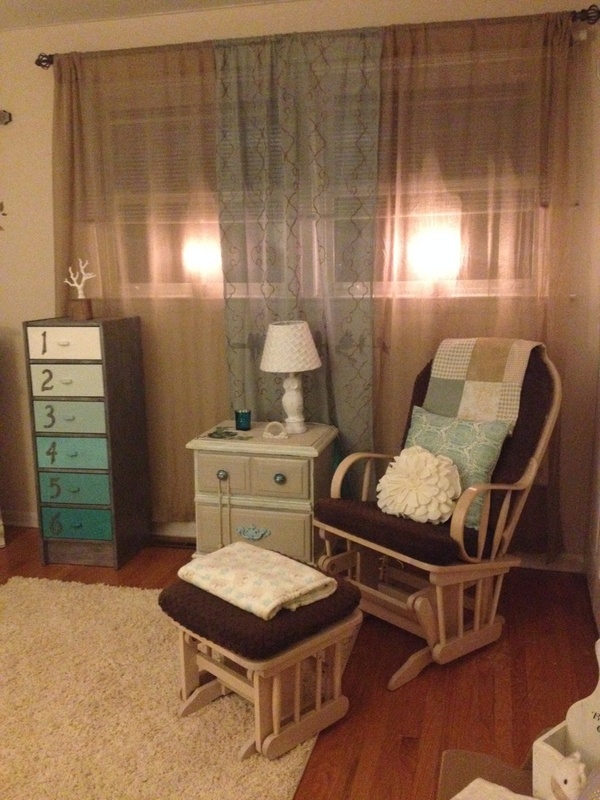 Perfect for a beachy/cottage nursery! And look at those great lines along the bottom…who knew they even existed?! Next came a room-sized rug. I wanted a shag rug because I loved the texture, but most I saw were $150-$200. I found a 5 by 8 rug at Walmart on sale for just $68…and we love it! Photos of it are in the full-room shots at the end. 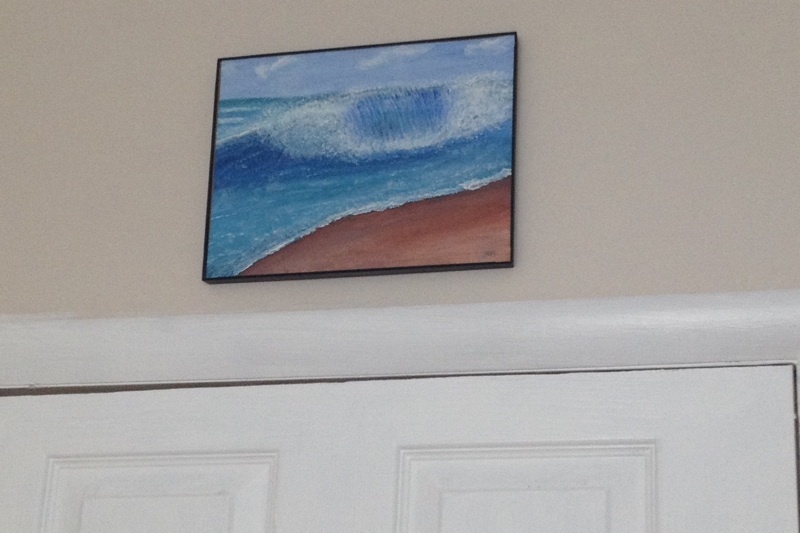 The wave painting is by me, just adding a beachy touch to her room. 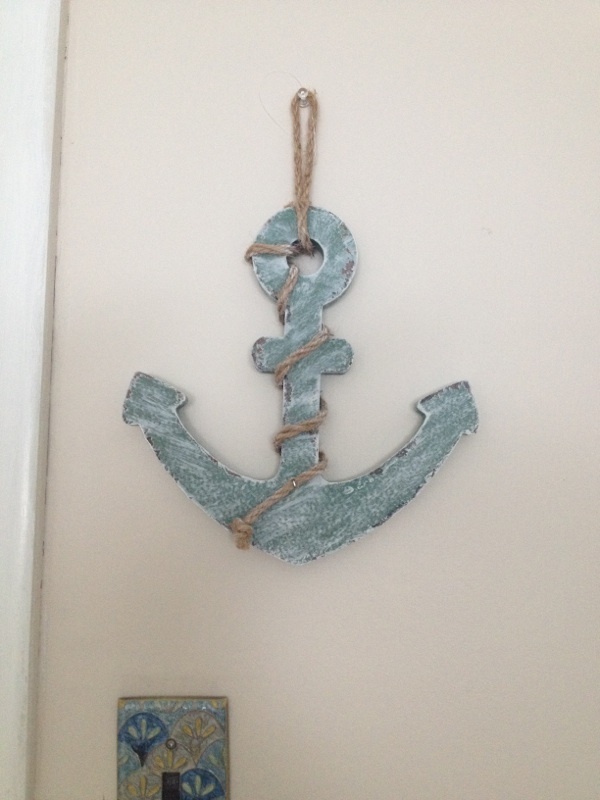 I shabby-painted the turquoise anchor hanging. 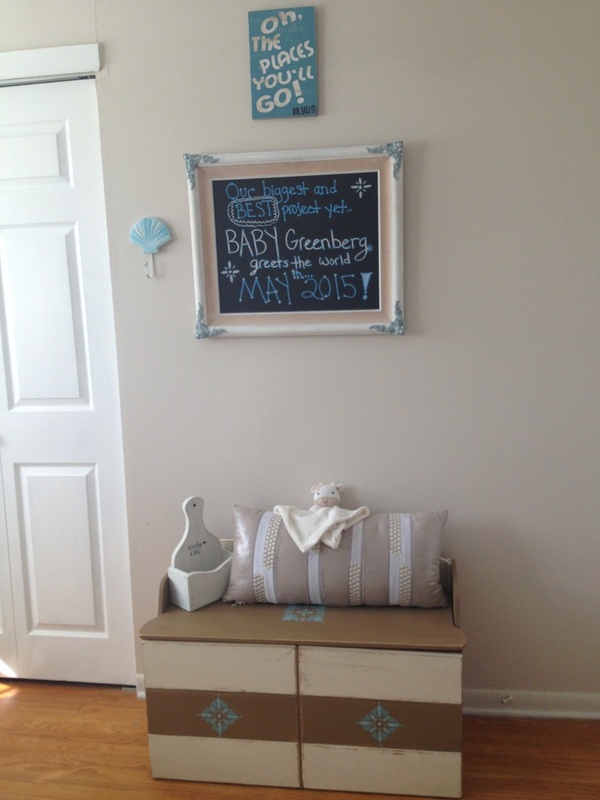 The announcement chalkboard was a $4 thrift store frame I painted. The Dr. Seuss was made for me by an Etsy artist. 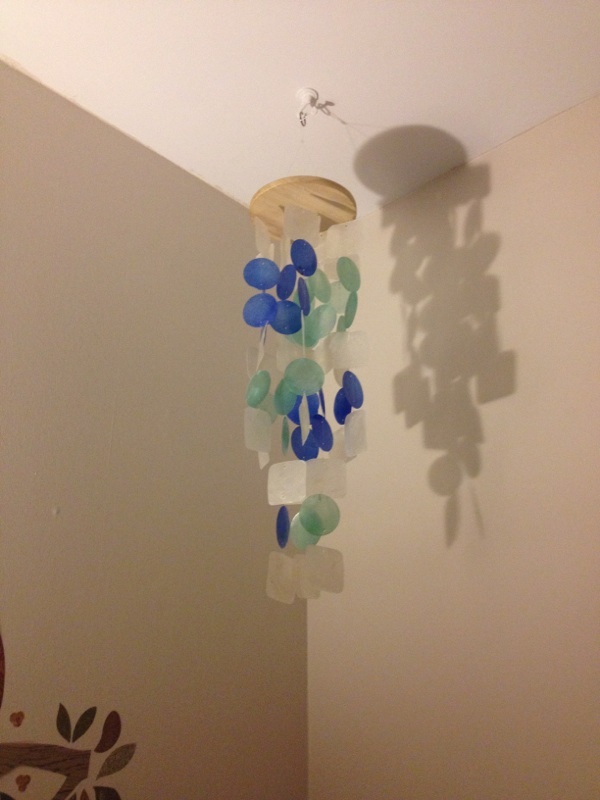 The capiz shell mobile was bought over Valentine’s Day weekend in Cape May by us for just $10 (off-season). 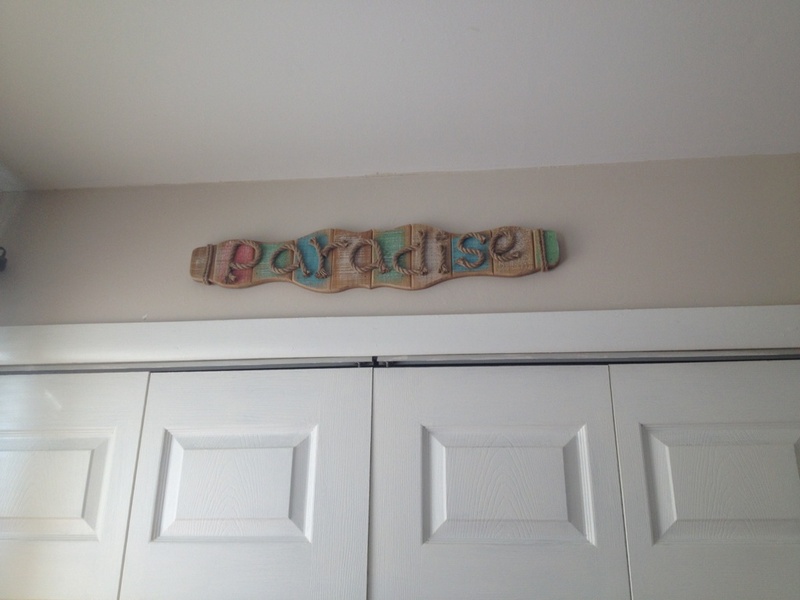 The other signs are perfect little inexpensive touches I found. I already had sconces and owl decals on the walls that I love and kept up. I think it’s time for the finished photos, of everything put together. There’s hardly a single piece in this room that I have not rehabbed, painted, touched, enhanced, etc. I wouldn’t have it any other way! This room makes me so happy. I walk in all the time and it still manages to feel surreal. Now, for one of the best parts…the cost breakdown! I will tell you that EVERY single thing you see in those photos add up to an amount that is almost silly. 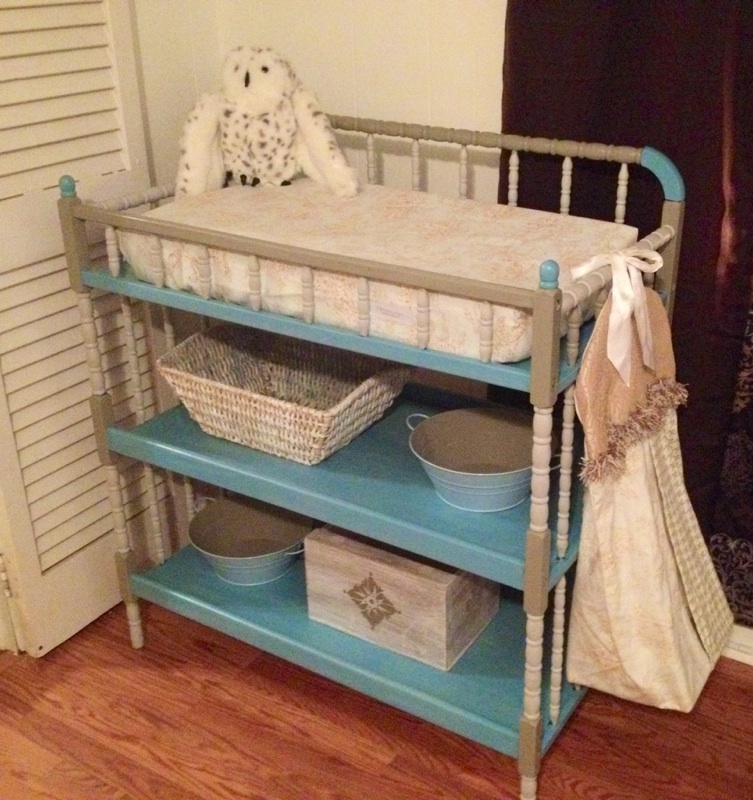 This nursery was entirely created on a budget of LESS THAN $500!!! 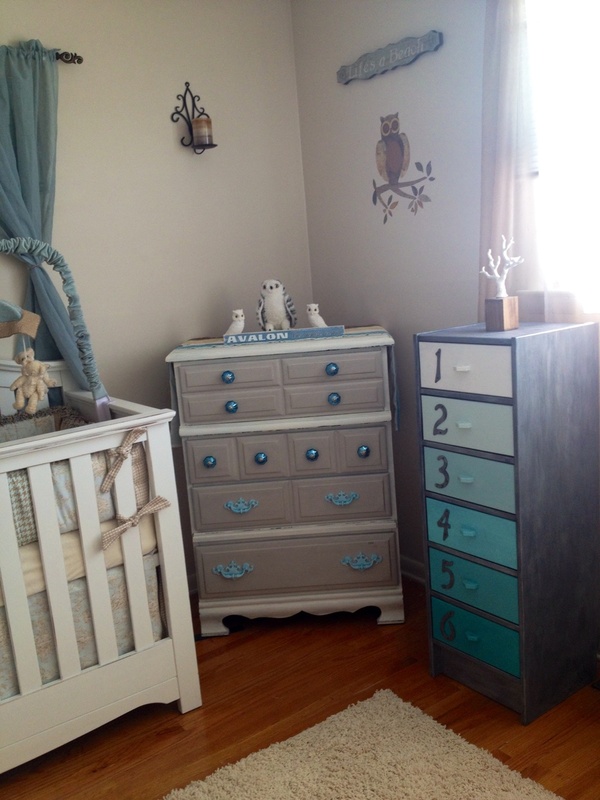 $474 total for entire nursery, all items in it. Should have cost: $2500+ with secondhand dressers. 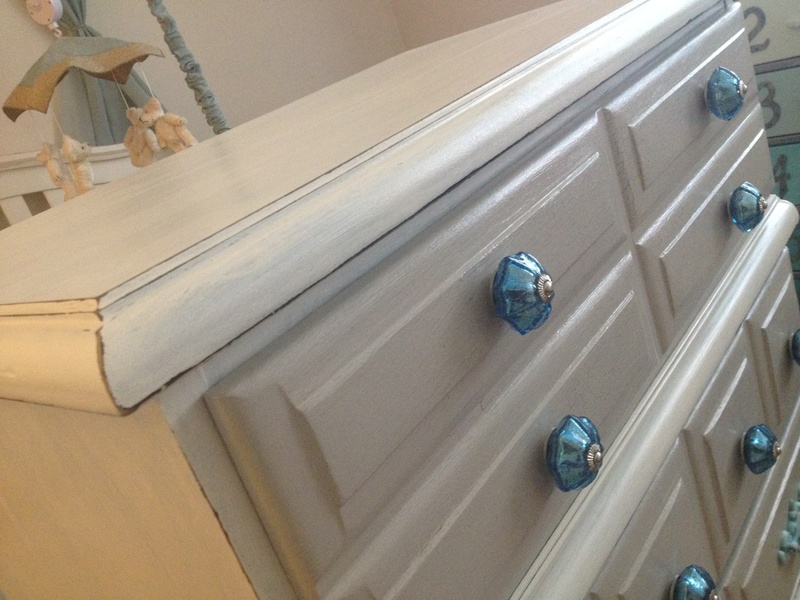 Should have cost $3200+ with brand new or professionally repainted dressers. The long and short of it: I am 7 months pregnant with my first child, a baby girl, due May 18th 🙂 If you count back from my last entry, it’s kind of self-explanatory. My pregnancy has been rough, and naturally, I cannot use most products I used to when doing projects, nor have I had any energy to do them anyway. I’ve avoided traditional paint, dust, chemicals, fumes, all the toxic nonsense. But I had a nice snow day off from work today, and decided to tackle a tiny, fun little project. 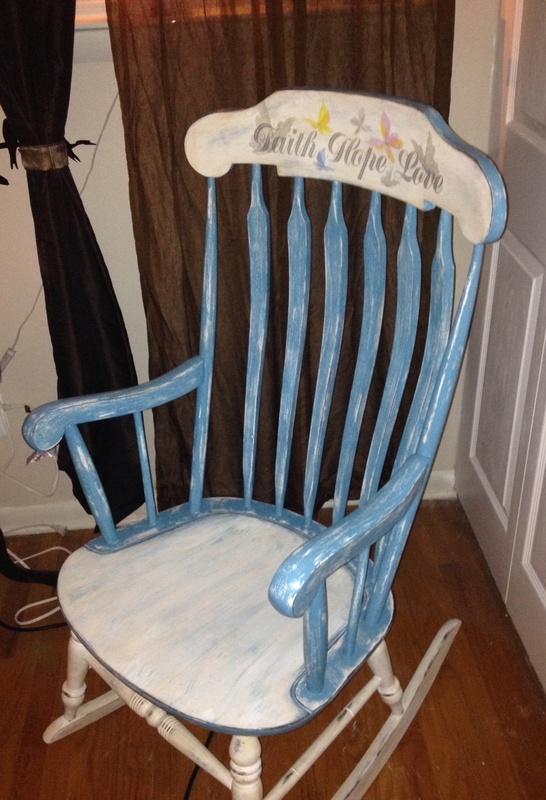 The shabby rocker from my last entry? 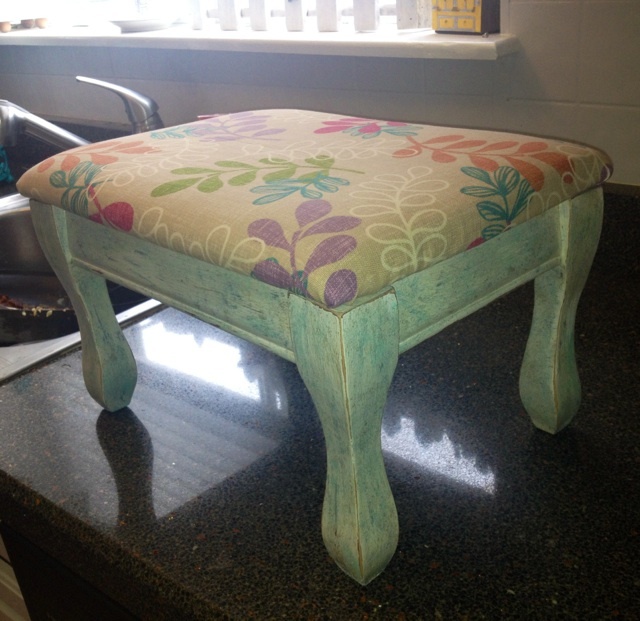 This cute little footstool goes with it…it’s down in our den and ready for downstairs feedings and rocking the baby! 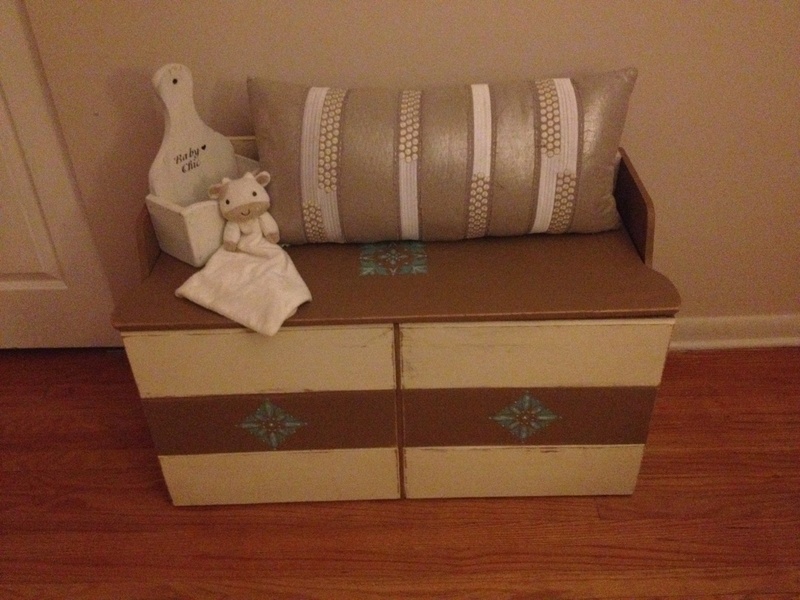 We ended up getting a comfy secondhand glider/ottoman for the nursery. 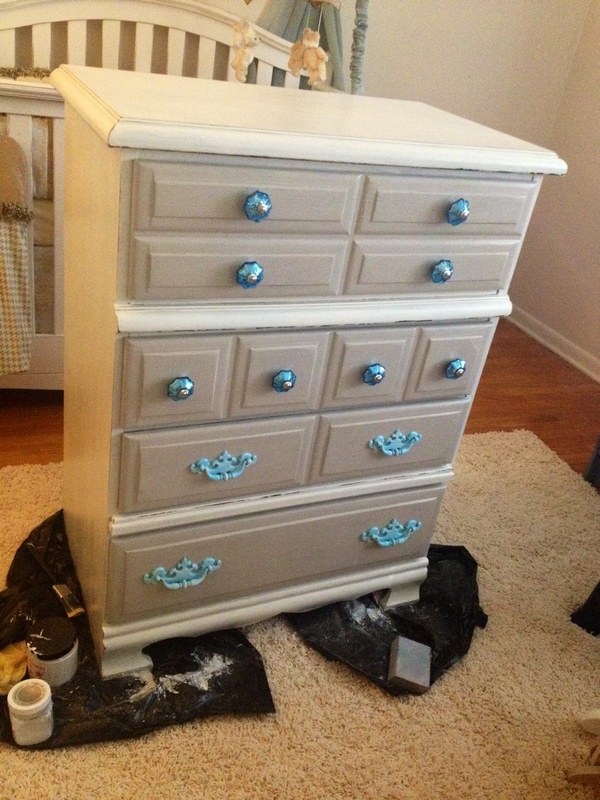 Before I get down to it, I DO finally have a huge project in the works, and it’s slowly getting there…my 50-year-old family bedroom set is now my daughter’s nursery furniture and it is being rehabbed. 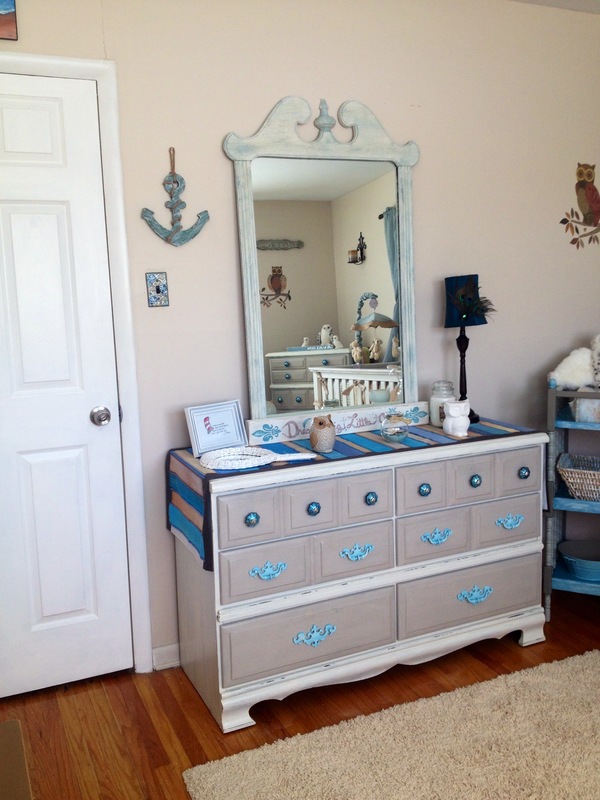 All drawer tracks were repaired by my hubby, tracks are being greased, new hardware is being added, and the dark pine frames are being painted with a beachy look to go with the “shabby beach cottage” nursery. I kept the drawer fronts their original dark pine. It is a unique, high-contrast, almost odd look. I’ll take photos of the completed nursery soon. I knew this was what I wanted in a nursery, whether the baby was a boy or girl. 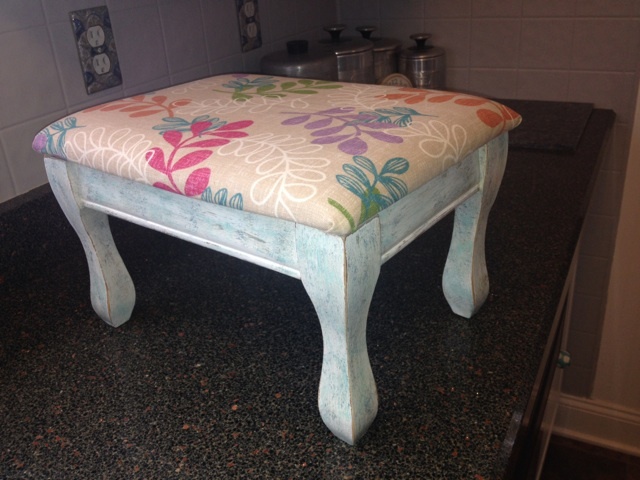 So back to the task at hand…here was my raw material for the footstool. The second photo was me deciding between two fabric choices. 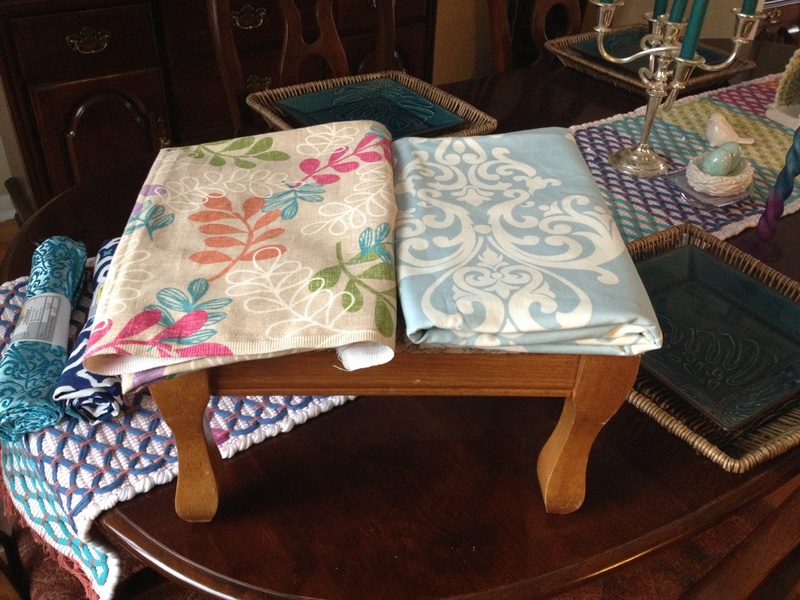 I opted for more color and saved the blue and cream etoile for another day/project. 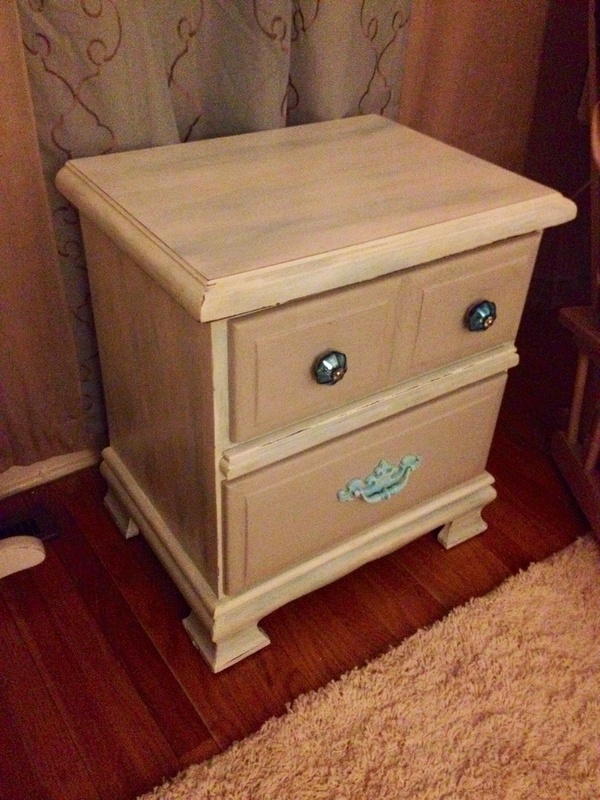 The colors used for it were Shabby Paints’ “Alamo White”, and 3 custom-mixed accent colors…a beachy slate blue, an oatmeal beige, and a mint green…I did the base coat of the white and then highlighted with the others. 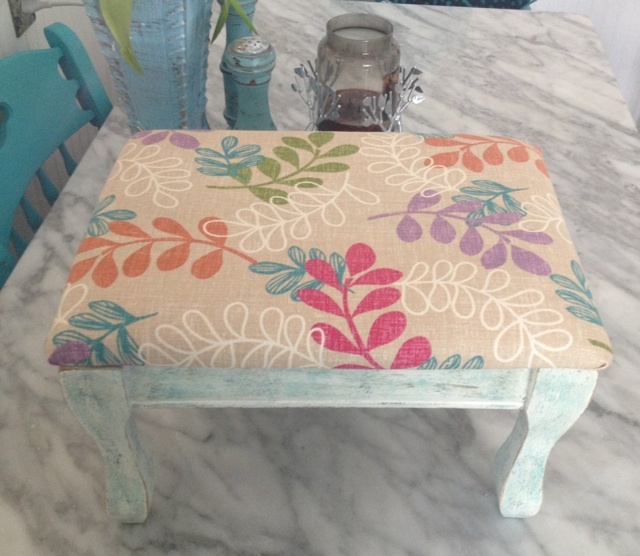 After re-upholstering the top, here is the end-result (and hubby and I both love it). 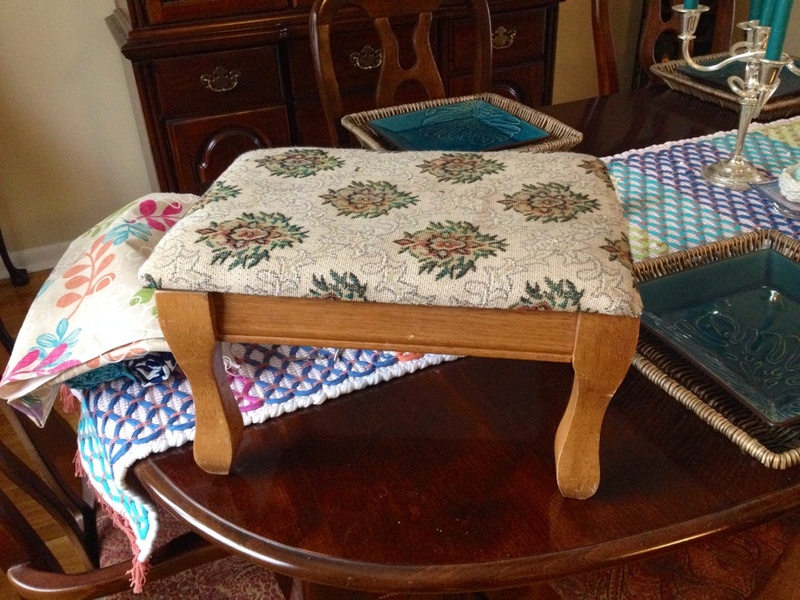 Footstool: Free 🙂 We sold off some items (like our game table set) from the second half of the den to make room for a playroom and space for the baby, and this was purchased with some of the money we got for it…it gave us a very nice Valentine’s Day out together at the Jersey Shore. Fabric: $1’s worth of fabric purchased from a Walmart remnant. 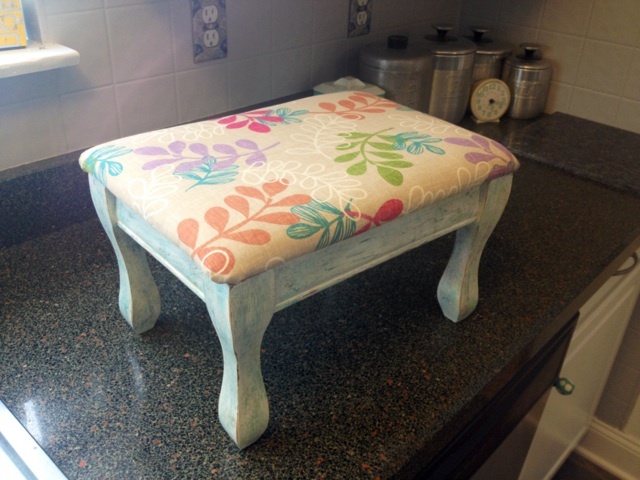 I still have half left for a small pillow or a seat-pad if I decide to make one. All tolled, this project would have cost about $8 if I were actually paying for it. Doesn’t get any better, does it? 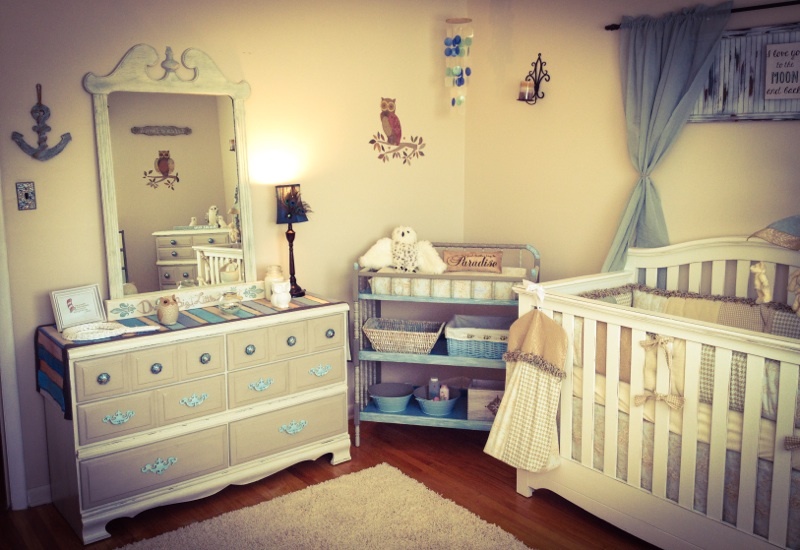 Within a month, there will be an update showcasing the final product that is Babygirl’s fabulous nursery! 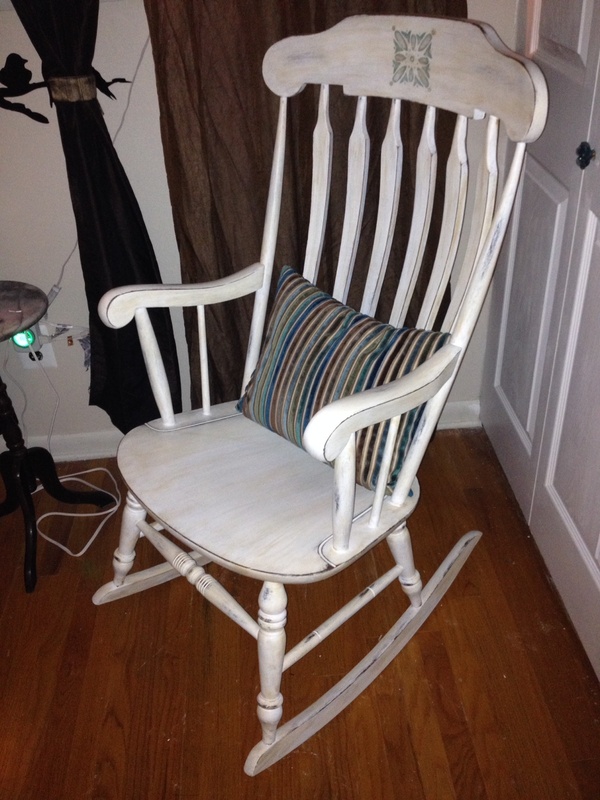 A while back, I found a vintage, mahogany Nichols & Stone rocking chair at my local thrift store for just $2.95. It was solid, sturdy, comfortable, and worth so much than I paid for it! 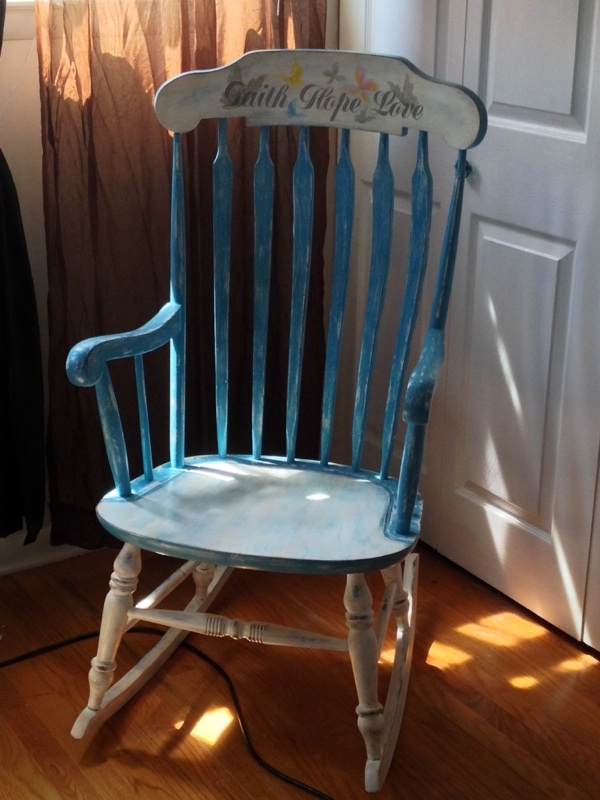 Originally, I gave it a white, distressed chalk paint makeover with a rubbing of brown antiquing wax over top. 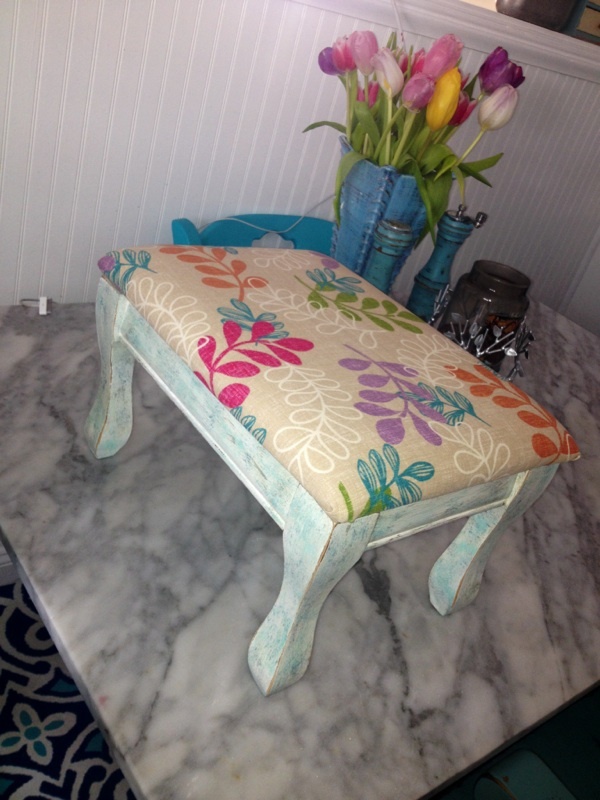 I stenciled a design onto the top…it was pretty. But after a month or so, I kept getting the nagging sensation that the rocker, while beautiful, was not made over to its full potential. I wanted to try something a little more “out of the box” and unique, while still being something that wasn’t too “loud” (if that makes any sense). In remaking it…I first decided to leave the base alone. 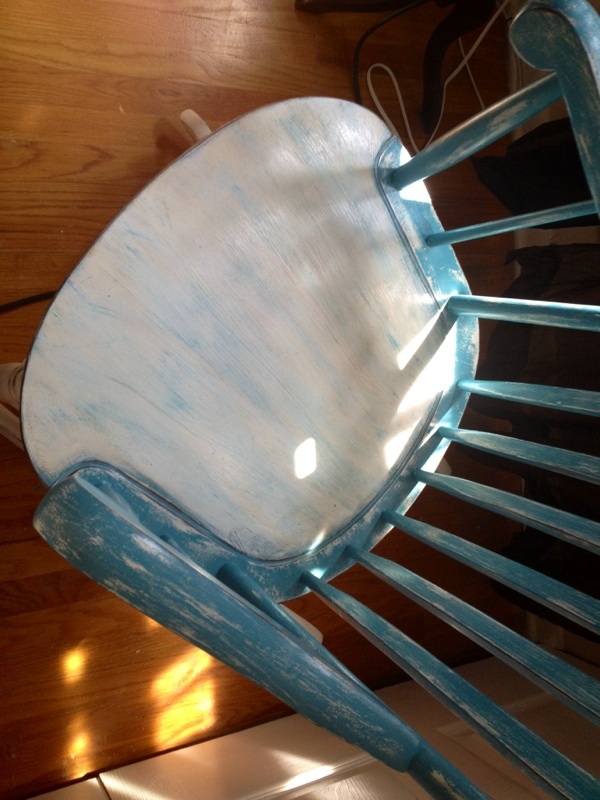 I wanted to try a cool distressing technique where you seal the current finish well, paint one thick coat of color over top of the old finish (in this case, I used “dynasty blue” by Shabby Paints), and then distress/sand just enough to get down to the old finish, but not to bare wood like is typically done. 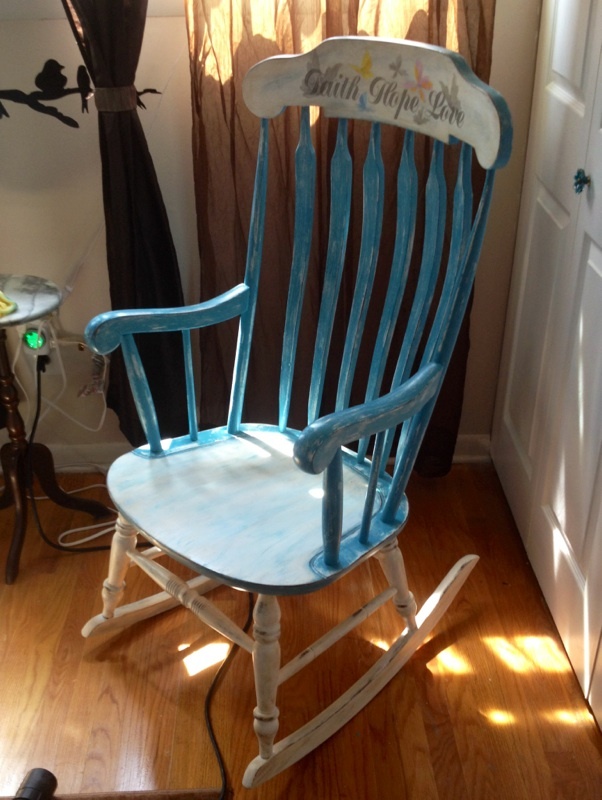 The result would be an awesome shade of blue distressed to show the white/cream finish underneath for a unique effect. It came out better than expected! 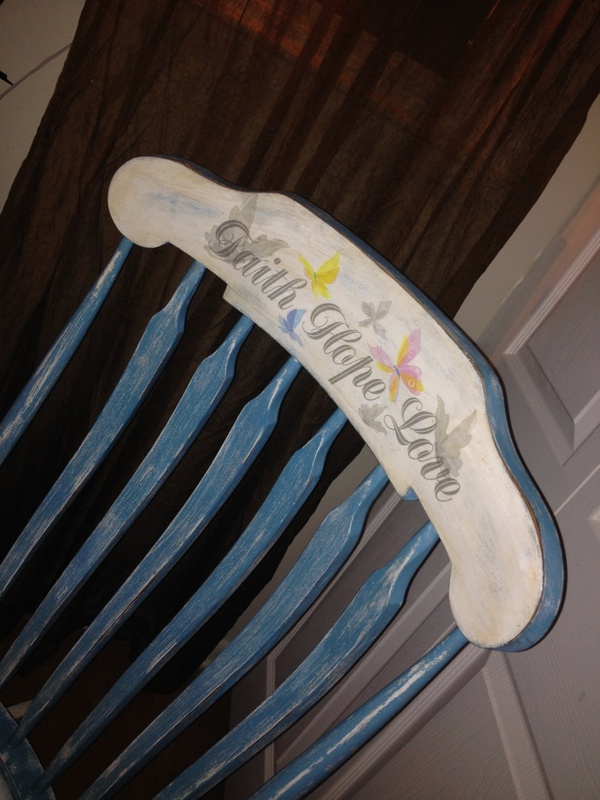 I then decided to leave the seat the same color as the base, but to add some subtle tones of blue in it for interest. 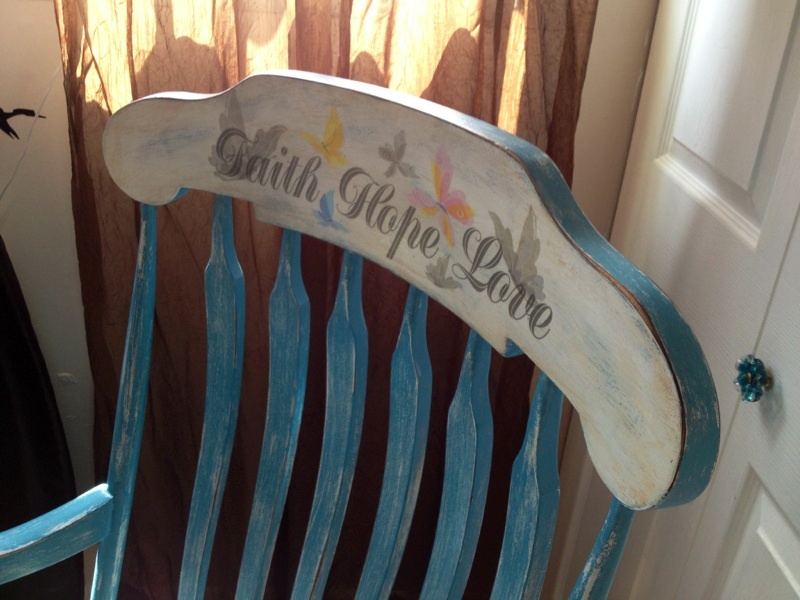 The top of the rocker also got the same finish as the base to pull it all together, and rather than paint or stencil a design onto the top permanently, I opted to use a cute, $1 decal I had that can easily be removed for another or some other type of design in the future. The butterflies sold me! I enjoy this revamp far better than the original makeover I gave it! People often think I am nuts as an artist to constantly change things out or move something to make room for a new piece, but that’s my process and it’s fun for me! More colorful and interesting? I think so. Thoughts? Best/Favorite Beauty Buys of 2016!